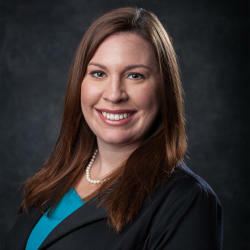 Jenna Vinson is the Vice President of Advocacy and Outreach at the Greater New Braunfels Chamber of Commerce, Inc. Her role is responsible for communications and marketing, government affairs, military affairs, web ad sales, the retirees council, New Braunfels Jaycees and the Hispanic Business Alliance. Vinson grew up in the Buda/Kyle area and graduated from Jack C. Hays High School. She attended Texas State University where she received her Bachelor’s Degree in Mass Communications – Public Relations. She then received a Master’s Degree in Business Administration from Texas A&M University-Central Texas. She began her career in communications as a public relations intern with the Austin Turfcats, a professional indoor football team, where she worked her way up to the Director of Media Relations position while completing her undergraduate degree. Upon graduation she accepted the Project Manager position at the Greater Killeen Chamber of Commerce in Killeen Texas. She served in that role for three years and then moved into the Director of Strategic Communications position. Vinson joined the team at the New Braunfels Chamber of Commerce as the Communications Coordinator in April of 2014 where she helped organize and streamline the Chamber’s social media, advertising, public relations, communications, brand management, digital marketing, and website content and helped revitalize the New Braunfels Jaycees. She assumed the role of Vice President of Advocacy and Outreach in October 2017. Vinson completed the four-year Institute for Organization Management through the United States Chamber of Commerce in 2016 as well as the Texas Chamber of Commerce’s Basics Course and the Texas Economic Development Basic Economic Development Course. Professional awards include Best Media Department/Most Coverage in the Southern Indoor Football League in 2009, Bronze medal in the category of Collateral Material-Publication Design from the American Advertising Federation-Central Texas in 2015, Texas Chamber of Commerce Executives first place award for the New Braunfels Chamber’s website in 2015, and the Association of Chamber of Commerce Executives Award for Communications Excellence for the Chamber’s 2015 image campaign. She and her husband Jared have a one-year old son, Easton, and are expecting another son this July. She is an avid reader, devoted Spurs fan, loves playing Texas Holdem, and spends her free time enjoying the company of her family. If you could time travel, what time period would you visit first? The American Revolution, while it was a difficult time in our history, it would be fascinating to experience the hope, strength, determination and passion that went into the rebellion as well as just the daily life of our fore fathers who had the insight to build one of the most powerful countries in the world.